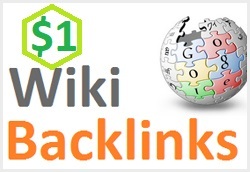 i will give you 250+ wiki articles backlinks200 plus wiki articles contextual backlinks for $1 only. it's a great offeryou can buy more than 1 quantity Importance of backlinks:Backlinks or Inbound Links (IBL's) are links that are directed towards your website and are the building blocks to good Search Engine Optimization. The number of backlinks a website has is in a good indicator of its popularity or importance with search engines.What you will get:250+ Wiki backlinks to your site or any link [youtube also]After completed work, i will send you full working report, then you can verify Backlinks are from profiles and articles so you will get a mix combination of backlinksneed more backlinks service?Then please look at my extra services for best cheap prices...Follow my profile for future updateMark as ‘Add to favorites’ for future use this serviceOrder Now. 250+ wiki mix profile and articles submission is ranked 5 out of 5. Based on 15 user reviews.